Edgar Alwin Payne was born on March 1, 1883 in Washburn, Missouri. His childhood consisted of working on his family farm while receiving limited and minimal education. At a young age, Payne developed a passion for pictures, but was not supported by his father who saw his talent as a waste of time and often punished his son for painting. Payne’s first experience in seeing a painting was based on an oval scene painted on the back of a farm wagon. In an attempt to copy what he saw, Payne tried to draw and sketch on anything he could get his hands on. The three colors around the house in which he was able to use were his father’s white lead housepaint, his mother’s bluing, and red that he made out of pokeberry juice. In the summer of 1900, the Payne family moved to Lovelady, Texas. Here, Payne successfully painted various local sceneries from the Lovelady Town Hall to the battleship Maine in the Conroe. While he still painted, life on the farm was difficult and at the age of 14, he left home. His travels took him through the Ozarks and into Mexico. He took on various jobs painting fences, signs, and scenery of a theatrical troupe that improved his painting skills. In 1907, having moved to Chicago, Payne enrolled at the Art Institute of Chicago but left after a short period. While in Chicago, he received direction and advice from two local artists Ralph Clarkson and Charles Francis Browne. 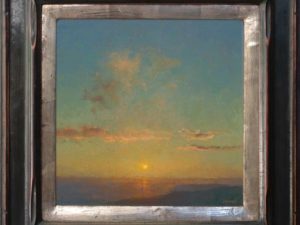 He began to sell some of his small easel paintings from exhibitions at the Palette and Chisel Club in Chicago. His earlier works were muted in tones with soft atmospheric lighting, which would change with his later works. 1909 brought Payne to sunny California where he spent a good portion of his time in Laguna Beach. He eventually made his way north to San Francisco and met artist Elsie Palmer whom he would marry on November 1912 in Chicago. In 1913, Payne received a commission from Mitchell and Hallbeck Decorating Company of Chicago to create a mural for the Hendricks County Courthouse in Danville, Indiana. This would be the first project in which both Elsie and Edgar Payne would work on together. Following the finished project, he began to earn enough from the sale of his paintings and started to turn down offers for mural paintings. He accepted his last project in 1917 with Holsag and Company of Chicago to create decorative murals for eleven floors of the Congress Hotel. Moving to Glendale, California, Payne enlisted the help of his artist friends Peter Nielson, Jack Wilkinson Smith, F. Grayson Syare, and Conrad Buff to work on the project. The project took four months and 11,000 square yards of muslin. After completing the project in 1918, Payne moved to Laguna Beach where he organized with the local arts community the Art Gallery and the Laguna Beach Art Association. He was elected to be the first president of the Laguna Beach Art Association. During his stay at Laguna Beach, he periodically took trips to the High Sierras and became well-known among the locals. One of the lakes, Lake Payne, was named in memory of the artist. In 1922, the Payne family spent two years in Europe visiting and painting in Paris, Venice, Rome, and other famous European cities. They came back in 1924 and traveled from coast to coast but spent winters mainly in and around New York City. On Payne’s return to Hollywood in 1932, he separated with his wife. On his own, Payne established his studio and lectured on the art and principle of landscape painting. The concepts in his lectures were put together to form the book The Composition of Outdoor Painting which he published and illustrated himself. The book embodied Payne’s methods and concepts as a painter. He died on April 8, 1947 at the age of 64. He is internationally known for his canvases depicting Indians riding through the desert canyons and landscapes of the Sierra Nevada reflecting his reverence and passion for nature. Member: Allied Art Association; American Artists Professional League; California Art Club; Carmel Art Association; Chicago Society of Artists; International Society Art League; Laguna Beach Art Association; Palette and Chisel Club; Salmagundi Club; Ten Painters of Los Angeles. Exhibited: Los Angeles County Museum of Art, 1919; Paris Salon, France, 1923; Golden Gate International Exposition, San Francisco, 1939; California State Fair, 1917, 1918; Art Institute of Chicago, Illinois, 1920; Southwest Museum, Los Angeles, 1921; National Academy of Design, New York, 1929; California Art Club, 1947. Works held: Art Institute of Chicago, Illinois; Bancroft Library, University of California, Berkeley; Chicago Museum, Illinois; Fleischer Museum, Scottsdale, Arizona; Indianapolis Museum, Indiana; Irvine Museum, California; Jonathan Art Foundation, Los Angeles; National Academy of Design, New York; New Mexico Art Association, New Mexico; Oakland Museum of California; Orange County Museum of Art, California; Pasadena Art Institute, California; Southwest Museum, Los Angeles.